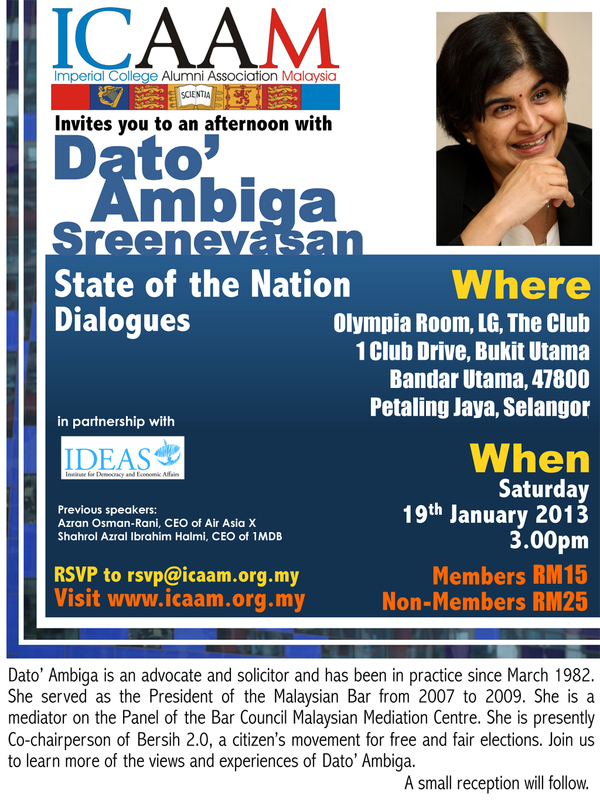 To begin the year of 2013 with a bang, ICAAM invites all members and friends to the third installment of our exclusive State of the Nation Dialogues, featuring Dato’ Ambiga Sreenevasan, Co-chairperson of Bersih 2.0, a citizen’s movement for free and fair elections. The series will also mark our first partnership with the Malay Mail, Redberry and IDEAS beginning the year of 2013, after a previous two successful dialogue with Azran Osman-Rani, CEO of AirAsia X and Shahrol Azral Ibrahim Halmi, CEO of 1MDB. There will be light refreshments at the beginning of the Dialogue, so do come early and enjoy some networking and food before the session begins. Bandar Utama , Petaling Jaya. As seats are limited, we will be confirming you on a First Come First Serve basis, so please RSVP immediately. An e-mail of confirmation will be sent to you on the 11th January, 1 week before the event begins. Priority will be given to Imperial College alumni and their networks.